Myspace icons express who we are. MySpace Icons for your profile and comments, custom-made for the Long Hair Boutique. 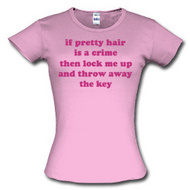 If you like our graphics, visit the Long Hair Boutique Shop for cute and funny t-shirts and more! Please make sure you save the individual MySpace Icons (right click and save) and include a link back to "https://www.longhairboutique.com" to keep the site up and running! If you have any suggestions or requests, please contact me. Thank you for your support, every order helps keep our free content up and our site running! Come back to the website anytime for hair care, hair styles, trends, cuts, and beauty tips. Click here to view the entire selection. then I found your website. straighten it, and I love it now!" of more long hair styles.